Need Free Wood Chip Mulch? Contact Us! Are trees and shrubs on your property in need of care and maintenance? Obvious wounds, disease or decay? Unkempt, overhanging or hazardous growth? Areas that need to be cleared for appearance or safety? Trees that would be more vigorous with correct pruning and fertilization? All of these issues need to be handled by a team of fully-trained, certified and insured professionals. You need the Antietam Tree team of qualified arborists and tree service professionals. With over 50 years of experience, Antietam Tree & Turf is the true expert firm. 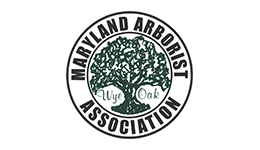 Their professional employees are Maryland-Certified Arborists and have received recognition as Certified Arborists from the International Society of Arboriculture. In addition, the Company is accredited by the Tree Care Industry Association. Tree Pruning, including crown cleaning, crown thinning, crown reduction and shaping, crown restoration pruning, crown raising, structural and developmental pruning, 24-hour storm damage, tree removal, and stump grinding. Antietam has all the equipment needed for proper tree care, including aerial lift trucks (bucket trucks), chippers for mulching, stump cutters, and log lifters. Services are provided for residential and commercial clients, including rental properties, municipalities, non-profit organizations, and government agencies. As a community service, Antietam Tree & Turf delivers free truckloads of wood chip mulch. Contact Us for details. Thank you and your staff, Mac and Levi, for coordinating and carrying out a very successful landscaping project at my house on September 21, 2018. The grass is growing beautifully due to your hard work and efforts. We are ISA Certified Arborists, MD Licensed Tree Experts, and TCIA Accredited, and have Certified Tree Care Safety experts on staff. We are Family Owned & Operated, Fully Licensed & Insured, and are Accredited & Qualified. Our Services include: Mulching, Tree Pruning, Plant Fertilization, Plant Health Care, Shrub Bed Design & Maintenance, Tree Cabling & Bracing, Tree and Stump Removal, Landscape Design, Landscape Maintenance, Agriculatural Renovations, Irrigation Installation and Maintenance, Storm Cleanup, Emergency Services, Landscape Installation.